UFC is returning to business this Saturday night (Sat., April 13th, 2019) with UFC 236 Pay-Per-View MMA event featuring two title fights at the top of the card which takes place inside State Farm Arena in Atlanta, Georgia. 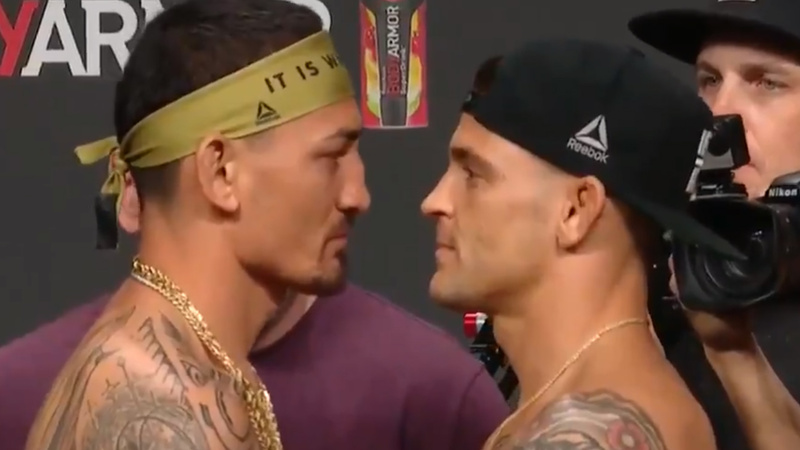 The main headliner features an intriguing interim lightweight title fight where current featherweight kingpin Max Holloway moved up to 155-pounds to meet formal rival, Dustin Poirier. Both first fought back in 2012 where ‘The Diamond’ beat ‘Blessed’ via submission at UFC 143. A victory will put either contender in a title unification bout against current lightweight champion Khabib Nurmagomedov later this year. The co-main event also features an interim middleweight title where rising sensation Israel Adesanya will look to add another win to his already impressive resume when he clashes against top contender Kelvin Gastelum. A winner will move on to meet division’s champion Robert Whittaker who’s currently healing up from surgery this fall. The main card also includes some great action as Eryk Anders will meet Khalil Rountree in a light heavyweight bout. Anders recently suffered a split decision loss to Elias Theodorou; meanwhile, Rountree also recently came up short against rising star Johnny Walker. Alan Jouban vs. Dwight Grant to clash in a 170lbs showdown and Vince Saint Preux vs. Nikita Krylov will open the card in a light heavyweight showdown. Fight fans can stream the UFC 236 PPV early preliminary card on UFC fight pass at 6:15 p.m ET, then ESPN prelims at 8 P.M ET and the main event begins at 10 P.M ET on ESPN+ platform. You can also order the PPV event at UFC.com. Who makes the 🌎 a believer?